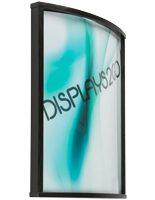 What makes professional wood poster frames an important part of presenting graphics in a business or office setting? 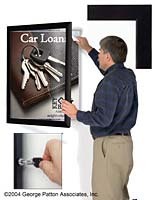 The ready made picture displays secure the expensive art prints or attractive movie advertisements from damage while providing an aesthetically pleasing boarder around the image. Custom framing is available in many different designs and colors to best match the décor and the promotional content. Wall mount options include black, mahogany and other natural finishes that will add to the overall aesthetic without distracting customers from the movie or art print. These ready made wood poster frames with durable constructions, commonly referred to as wooden sign holders, are commonly found in theaters, offices, retail stores, restaurants and homes. The custom framing collection offers different sizes to accommodate the precise dimensions of traditional pictures and banners. 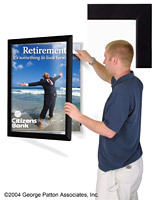 Keep custom sized art prints, traditional movie ads and the front page of the newspaper in full view at all times. 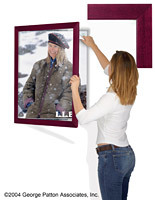 Wall mount picture displays are extremely convenient to install. Many of the wooden sign holders keep the graphics accessible for fast signage changes when necessary. These wood poster frames are art print displays with different shapes to hold the various contents. Custom framing includes shadow box styles, removable mat boards and hinged fronts to allow users to create a presentation with the exact features desired. 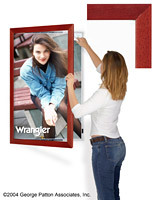 These wall mount frames have rugged fabrications to last a long time. The wooden sign holders will withstand normal wear and tear to showcase numerous campaigns throughout the year. These frames often include locking systems or latches to prevent customer tampering. 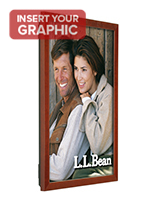 Ready made picture displays keep the movie or art prints looking great at all times. 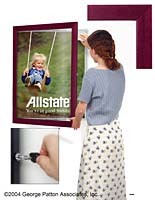 How do advertisers install pictures into the wooden sign holders? These attractive wood poster frames all include a hinged front for conveniently placing the images directly into the custom framing. Users simply need to pull open the black or mahogany to reveal the mounting surface. 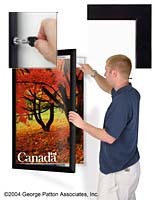 Wall mounting custom framing opens like a normal hinged door. Movie, art prints and other pictures are ready for positioning in the ready made custom framing. Lay the images in the picture displays at the appropriate placement. Customers can then use reusable adhesives or tacks to attach the movie or art prints. Close the swing custom framing to keep the border shut for showcasing the banners. Black, mahogany and other finished signage fixtures include gravity latches to ensure that the front is closed. 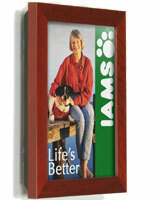 Some fixtures for art prints have provide users with a key for tightly locking the picture displays shut. These versatile wood poster borders are the ideal choice for many different businesses and establishments. Theaters use the custom framing to present art prints to promote upcoming movies and plays. 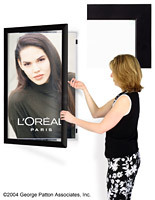 Retail store implements the ready made fixtures to advertise sales on goods and services. Galleries hold the custom art prints in the durable wall mounted designs to entice gusts to make a purchase. Even home owners can use the regal borders to add some class to the décor. These wooden fixtures are much more attractive than attaching pictures to the wall with a piece of tape. The alluring black, maple and mahogany borders will heighten the promotional presence in almost any establishment. Customers may add a white mat board to further improve the aesthetic. 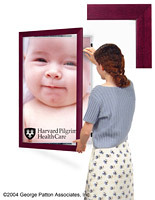 No matter the marketing campaign, the wide profile custom framing will increase awareness.